NaNoWriMo is short for National Novel Writing Month. The big writing event takes place every November. The goal of those participating is to write a novel of 50,000 words or more in one month. 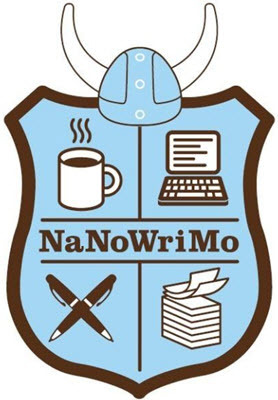 The NaNoWriMo badge or coat of arms contains coffee, computer, pens and paper all of which are needed to complete this difficult creative marathon. The NaNoWriMo event has been getting more and more popular every year since it first began in 1999. Over 400,000 people were expected to participate last year. In 2016 there were 384,126 participants and over 34,000 completed the goal of writing a 50,000 word novel. NaNoWriMo also has a program for young writers - NaNoWriMo YWP - that brings the NaNoWriMo style of creative writing into classrooms. The novel writing part of NaNoWriMo takes place in November, but writers first have to create a title for their novel in October. You can change your title later. Once November is underway and you have started writing you can keep NaNoWriMo updated with your growing word count. You can also earn different achievement badges along your creative journey. If you plan to participate and write a fast 50,000 word novel you will want a reliable computer and a good word processor or writing app. You will want plenty of coffee and some good ideas in mind for what your novel is going to be about. You might also find our word count and grammar checkers pages helpful. There are 30 days in November so 50,000 words is about 1700 words a day (1,666*) to be exact. That's about 7 pages of writing if you use a double spaced page and a 12-point font. If you miss even one day of writing your task gets bigger. Miss one day and suddenly you need 50,000 words in 29 days or 1724 words per day. Miss two days and you need 1785 per day. If you miss five days (oh my!) then you will be writing 2000 words per day on average on the other days of the month. You don't have to wait until November. NaNoWriMo also offers Camp NaNoWriMo that helps writers work on a novel (or shorter work) at any time of the year. The site assigns writers to a camp with up to 20 fellow campers for support and encouragement.